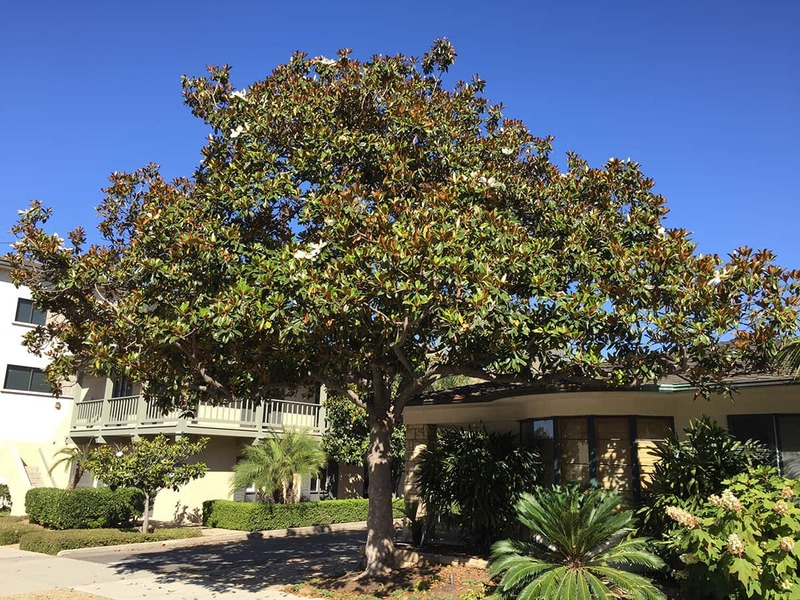 The Southern Magnolia has been one of the most widely planted trees in Santa Barbara since the late 1800’s. The magnificent street trees on San Andres Street are over 100 years old. Its popularity is due to its dense canopy of glossy evergreen foliage and large, white, fragrant flowers that appear from May through August. The flowers, which can be up to 12 inches across, have a delicate fragrance that reminds one of a fresh spring rain. 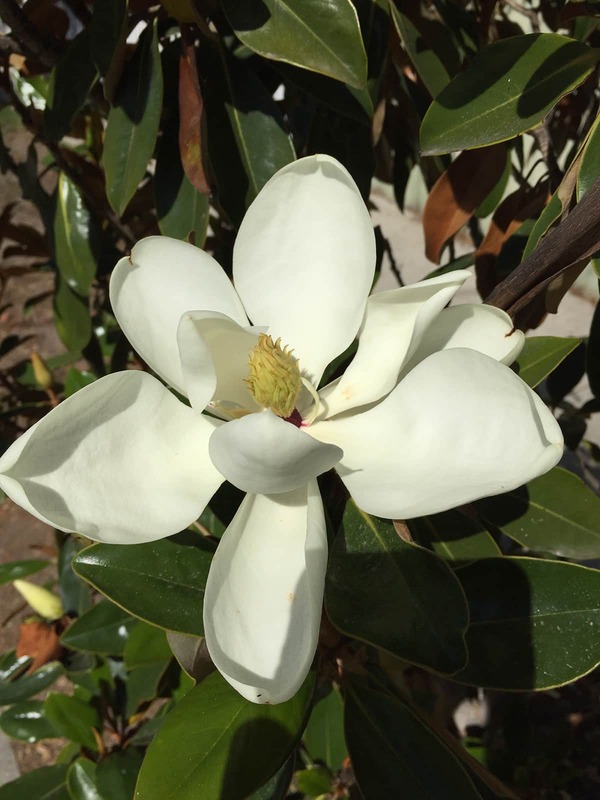 The Southern Magnolia is known botanically as Magnolia grandiflora. While it is native to the southeastern United States, it seems well suited to our climate, needing only occasional deep watering once established. The Southern Magnolia can grow quite large with a height of 50 to 60 feet and a spread of 45 to 50 feet. Fortunately, there have been many varieties selected and developed that offer sizes that can fit into almost any landscape. Two outstanding smaller varieties are ‘Saint Mary’ and ‘Little Gem’. The Magnolia ‘Saint Mary’ is a good medium-sized tree that grows 20 to 25 feet tall with an equal spread. Its leaves and flowers are also somewhat smaller. A very adaptable and sustainable variety named ‘Little Gem’ has grown in popularity in the last 20 years, because of its compact and uniform growth habit and low maintenance requirements. It grows in a pyramidal shape to a height of 15 to 20 feet and a spread of 10 to 15 feet. These beautiful, slow growing, and long-lived trees will continue to grace the streets and gardens of Santa Barbara for current and future generations to enjoy.